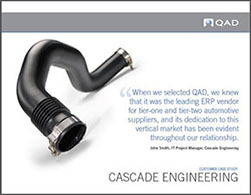 Please complete the information to the right to receive a copy of the QAD Cascade Engineering Case Study. To establish itself as a competitive enterprise in a fast-moving automotive industry, Cascade needed improvements to both its supply chain and financial reporting processes. With a strong and stable infrastructure, the company’s technology could expand and change as quickly as the market commanded.